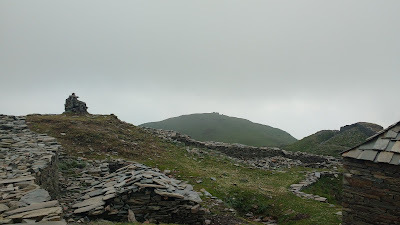 Raghupur Garh is a Himachali fort located about 3km westwards of the top of Jalori Pass, at a height of 3500m above MSL. The fort, unlike other local structures we'd seen nearby, had very little woodwork. 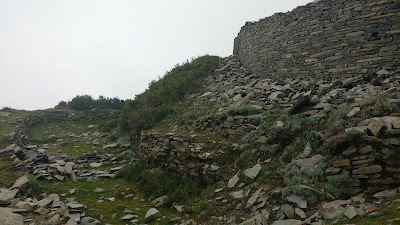 Flat stones, meticulously stacked on one another made up the fort walls and other structures. 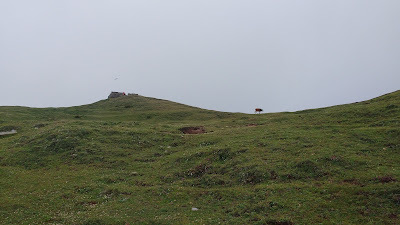 The fort is located in the middle of a high-altitude meadow and has commanding views of the Northern (inner) and Southern (outer) Seraj Valley. We were a bit unlucky with the weather - cloud cover and drizzle meant that the views were restricted and photographs dulled. It was a fun hike nonetheless. 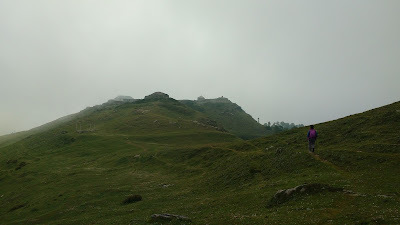 The fort is approached form Jalori Jot with a 3km hike of moderate ascend. Alternative routs are from Jhanjheli on the South and Gada Gushaini on the North. Both these routes are from the western half of the valley. 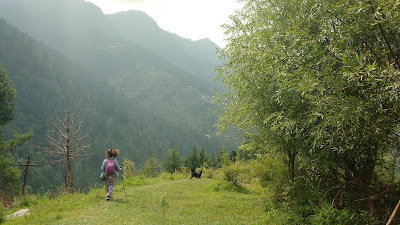 Routes from the eastern converge near Serolsar Lake and then onto Raghupur via Jalori. The Eastern routes come from Khanag to the South and Lambhari to the North. There are many more routes here used by the locals - almost daily. 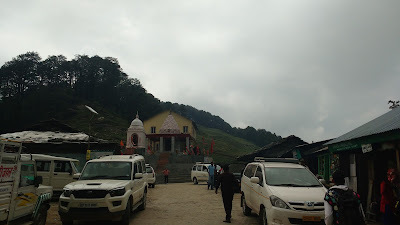 We started from Ghiyagi in a shared cab up to Jalori. This section of the highway is simply not a road fit for vehicular traffic. This, however does not mean anything for the steady stream of vehicles that ply this route on a daily basis. 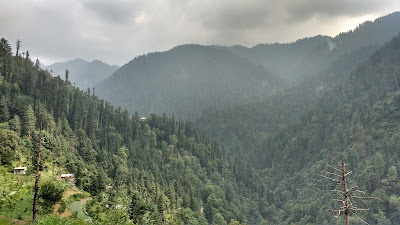 After all, this is the shortest route between Shimla and Kullu and a vital link fron the Seraj and Tirthan Valley to the capital. The 10km ride took more than half an hour and had our stomachs reeling. A quick chai at the top and we were off. Steady huffing and puffing for about 30mins brought us to the end of the tree line. The trees here, we were told, were the sturdy Kharsu Oaks, contrary to the tall Cedars and Pines we had seen in the lower valley. The tree line ended in a meadow. 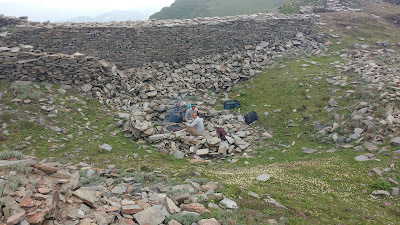 Another round of huffing and puffing for about 15mins brought us to visual range of the fort, and sighting a shepherd with his flock and sheepdog we took an opportunity to rest. Another 10mins and we were at the fort. 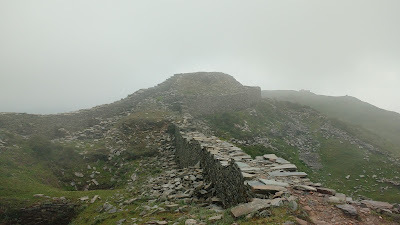 The views from the top were mostly blocked off due to the clouds and a chilling breeze was blowing through. 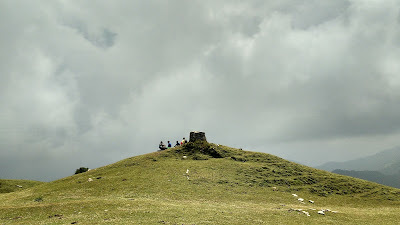 There are structures on the fort which provide shelter from the wind and are used by the locals to rest on their way. 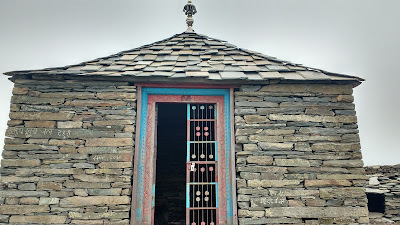 The temple of the fort also has a gate and can be potentially used for accommodation. A tank contains potable water. 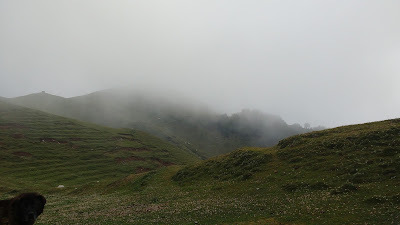 The descend to Jalori was fairly uneventful. 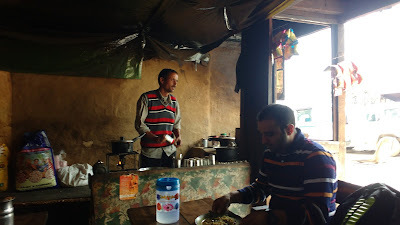 A quick recharging lunch at the dhaba here and we were off again. The buses were on strike that day, so we decided to walk down to Ghiyagi. We got ourselves a lift in a pickup playing the route. 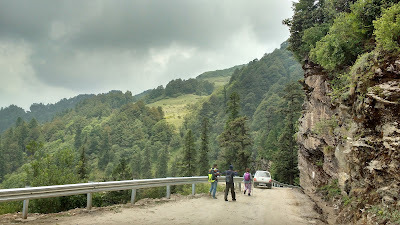 The key to descending this route is that the vehicle should be in first gear only, since sudden braking at excessive speeds tends to burn off the brake-pads leading to accidents - the frequency here is about one accident per day during the tourist season. 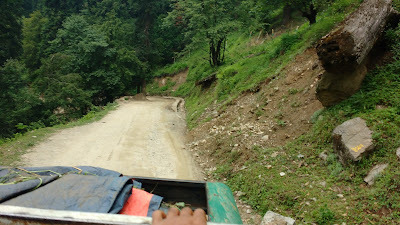 The ride down to Shoja - where we descended - was bumpy. 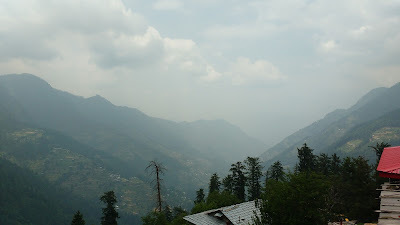 Shoja has excellent views of the Seraj Valley. 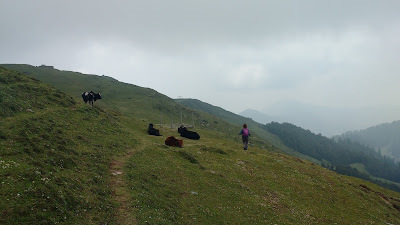 A steep footpath descends from here to the old Ghiyagi village and takes about 90mins to complete. Midway we were invited by a family for some mint-tea, which we gladly accepted. There were quire a few farms of cannabis (sativa) too. 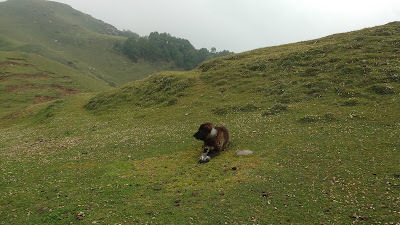 We had some siddus at the Shringi Vatika in Ghiyagi and then again walked the last 2kms down to our guest house in Jibhi. All-in-all, a good day's hiking. 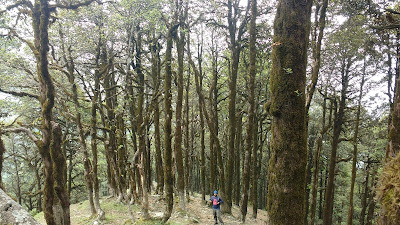 Such an amzing and serene hike to Raghupur Garh!! Beautiful captures Kapil!!! Very beautiful place to visit !! Wow, nice to know about this Fort. Trek to this place is definitely rewarding.